They also claim a lifetime of 100,000 shutter clicks, which is comparable to high-end Nikons and Canons. The 3fps continuous RAW shooting speed is not that impressive, however. You can check out the details in their press release, but you will notice that something is missing: No price and release yet, once again. The Foveon X3® direct image sensor featured in the Sigma SD15 digital SLR camera captures all primary RGB colors at each and every pixel location, ensuring the capture of full and complete color. Using three silicon-embedded layers of photo detectors, stacked vertically to take advantage of silicon's ability to absorb red, green and blue light at different respective depths, it efficiently reproduces color more accurately, and offers sharper resolution, pixel for pixel, than any conventional image sensor. Since color moiré is not generated, the use of a low-pass filter is not needed because full information of light and color can be captured with a three-dimensional feeling. The SD15 incorporates the "TRUE (Three-layer Responsive Ultimate Engine) II" image processing engine which improves the processing speed and overall image quality. The unique image-processing algorithm provides high resolution power and reproduces high definition images with richly graduated tones. The SD15 is equipped with DDR II buffer memory which is twice as large in capacity as the SD14's buffer. The camera's high-speed image processing circuits are capable of handling the large data files generated by the high-resolution 14 megapixel sensor. The SD15 features a continuous shooting speed of 3 frames per second with up to 21 RAW Images that can be captured in continuous shooting mode. 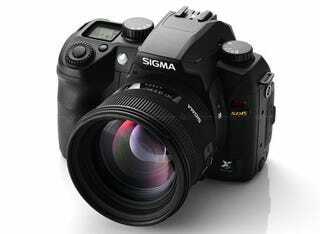 The supplied image processing software of "Sigma Photo Pro 4.0" converts RAW data quickly and easily. Incorporation of a new noise reduction algorithm reduces Chroma and Luminance noise when processing X3F files taken at ISO400 or more. It is possible to adjust the level of reduction for noise just by moving the slider in the control pallet. This software is compatible with multi core CPU's, ensuring high speed image processing. It also incorporates functions such as Loupe, slideshow, Printing, JPEG conversion and batch white balance settings. The Sigma SD15 camera's built-in flash offers an angle of coverage of 17mm (equivalent to 28mm with a 35mm camera) lens with a guide number of 11. The Built-in flash can be synchronized to a shutter speed up to 1/180 sec. Incorporation of S-TTL automatic exposure ensures the control of advanced flash photography. These many optional accessories are available for the SD15 to complement the user's style of photography. They ensure ease of use and comfortable shooting.